This is a version of the talk delivered at PACSA 2015 by Andrew Weatherall and Mike Blackburn on Social Media and Anaesthesia. As a bit of an experiment in demonstrating the scope for engagement different ways, Mike arranged a Twitter feed to run in real time on one screen while the presentation went ahead on the second screen. At the same time, the session was live streamed (well, until the connection broke). You can imagine when we got this topic it was pretty exciting. Try to talk on the entirety of social media with someone you’d never met in real life. And the talk pretty much requires you rely on the IT. What could go wrong? On the day, Mike pitched in with the old expectations of how you’d stay up to date and make sure you were providing the best possible care. A mix of journals and reading and chatting to people (along with clinical practice), with the occasional conference thrown in. Things have changed though. As mentioned by AW, one of the old challenges was getting access to some literature. Now the challenge is filtering an overwhelming amount of literature. Social media might just be a way to find the stuff that’s most relevant while also finding more colleagues to have that chat with. We got into social media through different paths but both ended up realising it could be a powerful tool in being better anaesthetists. Mike probably got there first, while AW first used social media to find contacts to provide an education in the area of research, and actively try to broaden his world view. The medical bit came later. Of course a social media talk without showing the media being social would be a bit flat. So for the talk, there was a case opened up for discussion. Discussing hypothetical cases is a powerful way to learn from other experts in any setting. 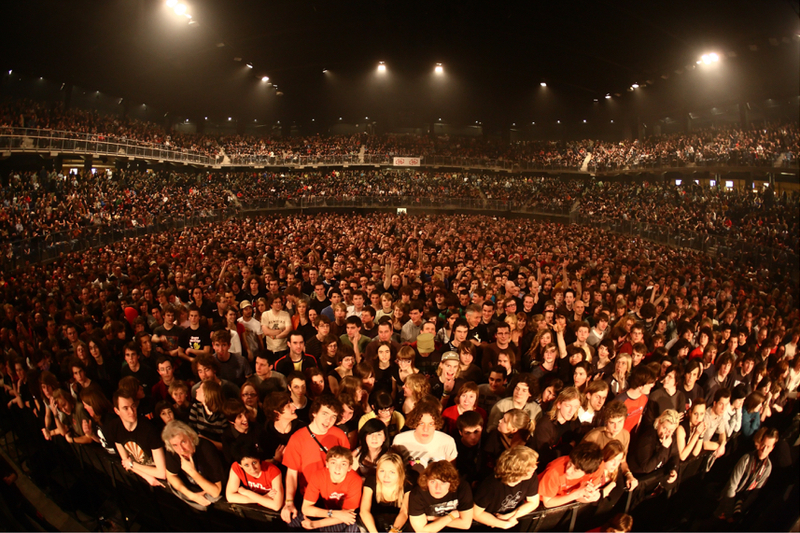 The advantage of social media is that you can effectively open up a much bigger room for that chat. So you can get thoughts from anaesthetists with very different backgrounds. This one chat alone had people chipping in from Canada, the UK, rural and remote Australia, Sweden and of course the room itself. What evolves is a good discussion of a variety of approaches, along with some reflections of what might be different in different settings. Of course, it can be relatively easy to find clinical guidance from the literature. What about when it’s not about the choice of drugs, or monitors? What results is the start of a worthwhile chat about different rules in different settings and a reflection on how different anaesthetists in different settings view things (and maybe how much what we have in common defines us more than our differences, even across the world). Of course you can’t see that on the Livestream, so here’s the Storify. Of course we had to provide some info at the same time. 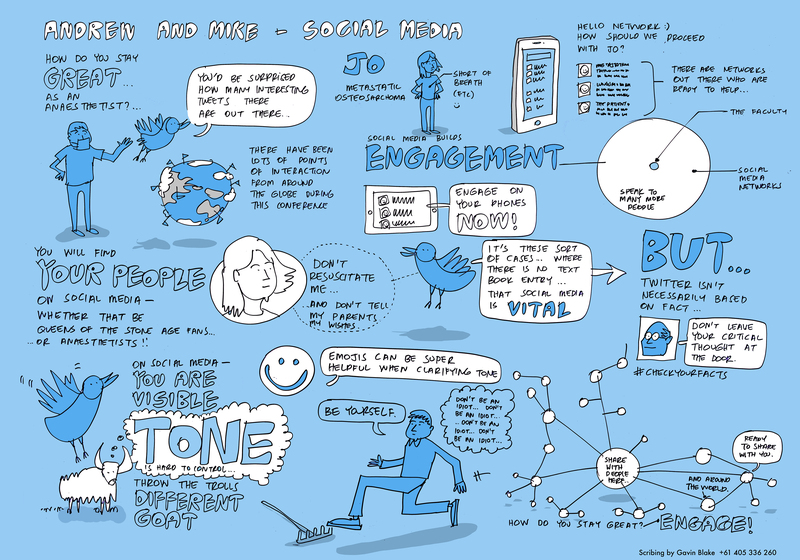 There’s obviously a bunch of great things to say about social media and what it can offer for the practising clinician. Social media offers more scope for engagement than you’ll ever find in the hospitals you frequent. Here’s just one example a group of marine scientists have previously published. This infographic has a bit of a breakdown. Darling E, Shiffman D, Drew J and Cote I. 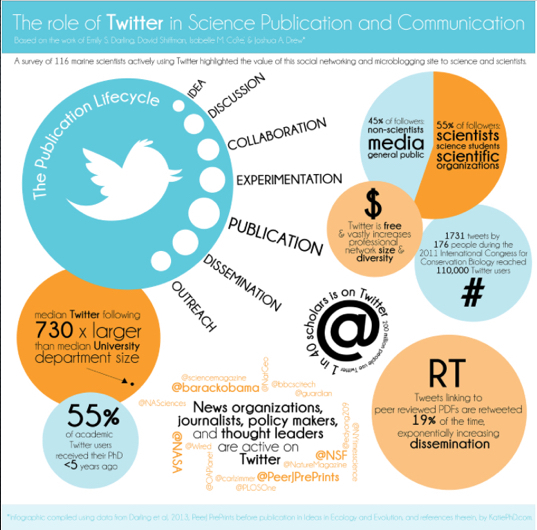 The role of Twitter in the life cycle of a scientific publication. Ideas in Ecology and Evolution 2013;6:32-43. Key things to note: the median Twitter following was 730 x larger than the median University department size. Have you got something you’d like to get out there? Well tweets linking to a peer-reviewed PDF were retweeted 19% of the time. If you handed around your latest thing in a paper format, would it get passed on 1 in 5 times? Imagine the spread of ideas. Social media gives you fantastic opportunities to learn from people entirely outside medicine (artists, writers, musicians, tech types, you name it). You can also find the other elements to your own intellectual life that medicine sometimes doesn’t give much scope for. As an example to demonstrate that we lined up someone with a particular set of skills (not Liam Neeson) that can help you look at things in a slightly different light. Part of the reason for that livestream was to let Gavin Blake from FeverPicture see us in real time. Back in Sydney. As we went along, Gavin illustrated the talk in real time, ready to share it back with all of us. A new way of looking at stuff and a new way of visualising your talk. Linking to a guy who provides this sort of stuff for all sorts of settings (anyone heard of TED?) – social media in action. Social media can also put you in a position to get involved in broader projects. Nicholas Chrimes, an anaesthetist in Victoria (the Australian version) has used it to push for better safety in drug packaging through the EZDrugID campaign. Less than a year later the Australian and New Zealand College of Anaesthetists is picking it up. You can control your experience and you can find your people. They can help inspire you in medicine. Sometimes they’ll just help. There have been lots of great discussions about how to look after each other and docs and mental health playing out on social media recently. It’s not all just sunshine of course. Like any place you’ve ever been, social media has its problems and it pays to think a little about them. Maybe you even need some strategies. There’s no other place you’d go as a medical practitioner and not exercise your intellect. So you don’t want to check it at the login page with social media. So don’t accept assertion as fact. To practice evidence-based medicine, don’t just accept a snappy opinion piece, go to the source and evaluate it yourself. Sometimes you’ll see great stuff, but it’s in a slightly different area of practice. Hearing from other practitioners is great, but you need to evaluate whether the stuff out there applies to your clinical profile. And don’t just go with the loudest voices. They might be loud because they are super great (as Mike says, the cream rises), but make sure you retain that wary eye. You have to assume everything you do online is visible. Imagine you’re going into a really big room at a pretty important function but you don’t entirely know who is in the room. What would you say? Would you think a little bit about what sprung forth? It’s worth thinking about how you want to present yourself on this space. Some doctors like to keep it entirely medical. Some don’t mind sharing a bit more of their personality. Either approach has its strengths. Just have a plan. Think really carefully about your tone and how things could be misinterpreted (sidenote from AW, I write more tweets than I put out – always do a double check). 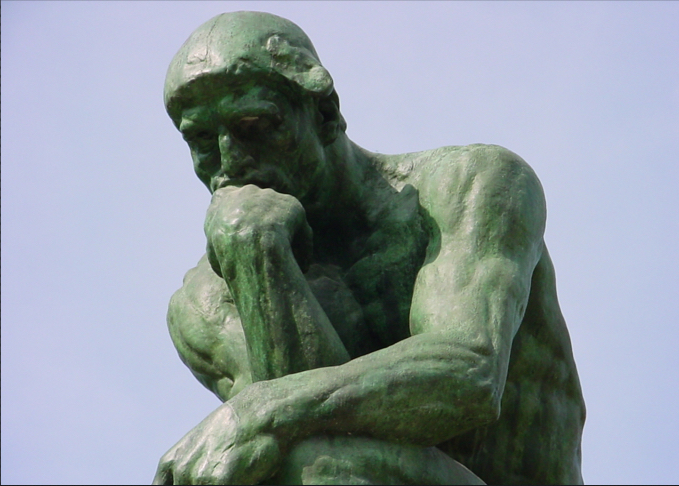 Need an example about how your intent can go awry? Enjoy (or don’t) the story of Justine Sacco as told by Jon Ronson (AW: I don’t agree with everything in his book ‘Shamed’ but it’ll certainly make you think). Regrettably some people aren’t online to just share great ideas. Some are there deliberately to be obnoxious. The rule with trolls? As per Mike – “don’t feed them”. Regrettably this is much more of an issue online for women. Sad, but true. Turn up, listen and be genuine like you probably are in every other setting and things can be great. There are people who struggle with interaction in real life who pull it off very well in cyberspace. Anyone can be excellent if they choose to be. There are lots of ways to do that. But if you were given the option of feeding off the insights of clever people from all over the world, medical or not, along with the occasional laugh, wouldn’t you do that? The final product from Gavin Blake at FeverPicture. Very cool. One thing we didn’t mention was blogs and things like that. If you think this stuff is OK on here, you could choose to follow. That way when a post turns up, you’ll get an e-mail to let you know. AW put this post together utilising the script plus slides that both speakers put together. The images here are all from the Flickr Creative Commons area and are unchanged. The QOTSA concert photo was by Matthew Field. 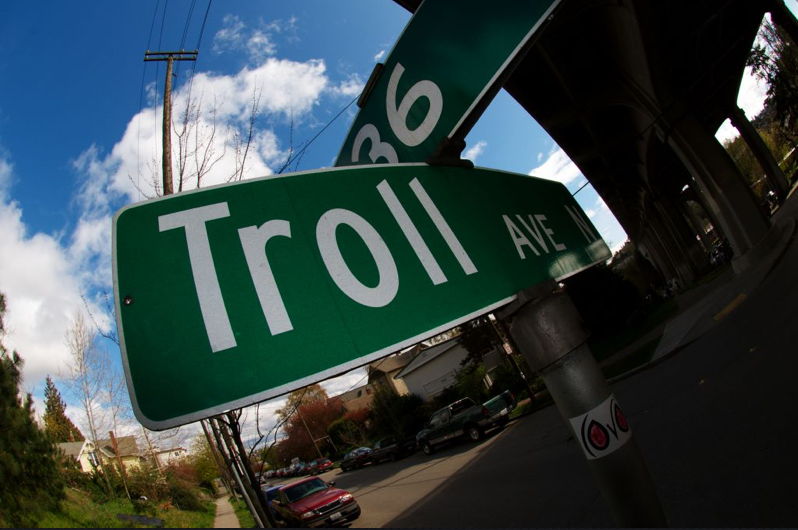 Troll Ave was by David Reid. At Gavin Blake’s suggestion we tried Livestream for the feed. The tech included a GoPro camera, an audio feed via the conference IT crew and a very annoying capture device to feed into the computer. Once the IT guys figured out how to get the camera talking through the capture device to the computer, it was pretty easy. A personal note from AW: the guys in SA did all the heavy lifting on the tech. This particularly applies to Phillipa Penfold who strongly supported our silly ideas and Mike himself who kept pushing when I wasn’t sure we should. Thanks to both of you. And a bunch of people made themselves available to make sure an actual chat happened. There’s so many to mention it’s hard to know where to start but the easiest thing to do is probably to see them as they appear in the other Storify which covers some of the other chat during the talk (you can see them say hello as they pop up). So inspiring to have people pitch in. Thanks.